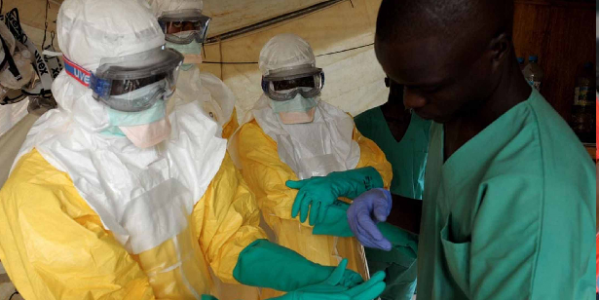 A Nigerian doctor who treated a sick Liberian man, Patrick Sawyer, who was infected with the Ebola virus has tested positive to the deadly virus, Nigeria’s Minister of Health, Onyebuchi Chukwu confirmed on Monday in a briefing. Sawyer died of Ebola virus on July 25. He, however, said the Federal Government had not been able to confirm whether the medical doctor has actually been infected with the disease. He said a total of 70 Nigerians who came in contact with the late Sawyer, including two other medical personnel who treated him, had been quarantined and placed under surveillance. The minister stated this in Abuja during a periodic briefing organised by his ministry to update Nigerians on the latest development on the deadly disease. He assured members of the public that the federal government was doing everything within its powers to stop the outbreak of the disease in the country but enjoined everybody to embrace good hygiene and constantly wash their hands. Sawyer, who became sick at the Murtala airport after arriving from Liberia and died a few days after receiving treatment at the First Consultant Hospital in the Obalende area of Lagos. So far, 729 people have died from Ebola in Sierra Leone, Guinea and Liberia, according to World Health Organization data but the agency has warned that the disease is spreading faster than efforts to control it.